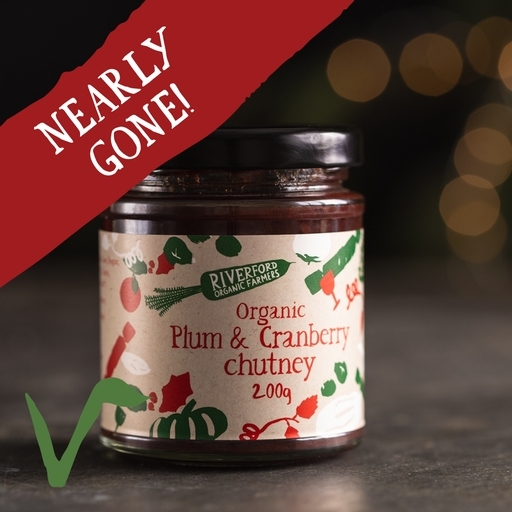 Our outstanding Christmas chutney, handmade with plump, juicy plums and cranberries, alongside chunks of apple, sweet dates, and plenty of festive spices. Dollop a spoonful alongside our cheeses and a glass of something boozy, or use instead of cranberry sauce to set off roast poultry perfectly. It makes a good gift, too. Store in a cool dark place. Once opened, keep refrigerated and use within 6 weeks. Kitchen Garden have been hand-making their award-winning organic jams, chutneys, marmalades and dressings in the Cotswolds since 1989. They’ve come a long way from founder Barbara Moinet’s kitchen table, but still use family recipes, traditional methods, and the best quality ingredients. They are Soil Association certified organic. Plums (61%), onions, raw cane sugar, cider vinegar, apple, cranberries (9%), dates, chilli purée, garlic purée, spices, sea salt*. Prepared in a kitchen where eggs and gluten are also handled.